Sarah Tolmie reads from The Art of Dying , which was shortlisted in the Canadian category for the 2019 Griffin Poetry Prize. The other shortlisted poets are Raymond Antrobus, Daniel Borzutzky, Don Mee Choi and Kim Hyesoon, and Ani Gjika and Luljeta Lleshanaku in the international category, and Dionne Brand and Eve Joseph in the Canadian category. Tickets ($20) are available from the Royal Conservatory box office. Sarah Tolmie reads from The Art of Dying at a session entitled “Observational Poetry,” together with Dani Couture. Sarah Tolmie reads at the Resonance Reading Series, together with Michelle Brown, Rebecca Papucaru, Blossom Thom, and Dawid Koloszyc. Sarah Tolmie reads from The Art of Dying as part of the Art Bar Reading Series. Sarah Tolmie reads from The Art of Dying , along with Pamela Mordecai. Sarah Tolmie reads from The Art of Dying at the 2018 Iceland Writers Retreat. 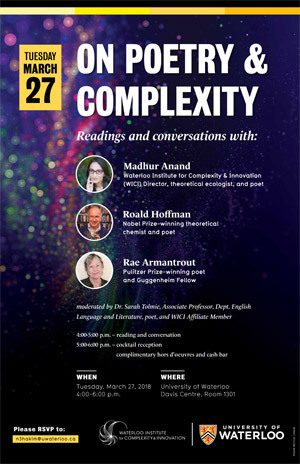 This event resulted in an article, jointly authored by Madhur Anand, Rae Armantrout, Roald Hoffman, Sarah Tolmie, and Osheen Harruthoonyan, entitled “On Poetry and Complexity: A Conversation at the Interface of Art and Science,” Rungh.org . Sarah Tolmie reads from The Art of Dying . The musical setting of poems from Trio by Erica de la Cruz, winner of the Trio Prize, will be performed as part of Conrad Grebel University College’s Noon Hour Concert Series. Featuring Sarah Tolmie, Kelly Robson, Alyx Dellamonica, Suzanne Church, and Marcy Italiano. Sarah Tolmie reads from her latest book Two Travelers . Sarah Tolmie reads from her latest book Two Travelers on a panel with fellow Aqueduct Press authors Brit Mandelo, Nancy Jane Moore, and Susan diRende. Joint launch of Trio , by Sarah Tolmie, and Tablature , by Bruce Whiteman, both in this year’s Hugh MacLennan Poetry Series by McGill-Queen’s University Press. A reading from Trio by Sarah Tolmie, and the presentation of the Trio Prize to Erica de la Cruz, winner of a competition for a musical setting of a sonnet from Trio . Baseline Press launches its 2014 chapbooks with readings by poets Darren Bifford (Hermit Crab), Sarah Burgoyne (Love the Sacred Raisin Cakes), Jeffery Donaldson (Slack Action: A Poem), Debra Franke (Where the Back Roads Take You) and Sarah Tolmie (Sonnet in a Blue Dress and Other Poems). Hosted by Karen Schindler. Also featuring Madeline Bassnett (Elegies, Froghollow Press). Hosted by Karen Schindler. With special guest Ben Ladouceur (Poem About The Train, Apt. 9 Press). Sarah Tolmie reads from NoFood at the Chiaroscuro Reading Series. A reading from The Stone Boatmen at the 38th annual WisCon, presented as part of “Renaissances” with Aqueduct Press authors Eleanor Arneson, Nancy Jane Moore, and Jennifer Marie Brissett. Followed by Q & A; refreshments will be served. With Suzanne Church and Jaz Ashton.